Library of Congress. Click image to enlarge. Edgar Allan Poe was a brilliant writer and editor, and a man who could appreciate a good glass of sherry. He was born in Boston and buried in Baltimore. Poe wrote poetry and fiction. In fact, he became the father of detective stories. 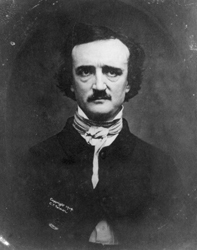 Edgar Allan Poe's father was David Poe Jr. His mother was Elizabeth Arnold Poe. Both, father and mother, were actors. In 1835, Edgar Allan Poe married Virginia Clemm. Virginia was his cousin and died in 1847. In 1849, Edgar Allan Poe got engaged to Elmira Royster. 1839 coeditor of Burton's Gentleman's Magazine in Philadelphia. Check out the Edgar Allan Poe National Historic Site, Pennsylvania.